While staff reductions may be necessary as sales slow in this economy, the people who serve your customers need to be the last staff considered for cutbacks. This is because customer service employees are in the absolute best position to help you keep your current customers. You probably already know that it costs 5-6 times more to win a new customer than it does to keep a current customer. A strong frontline keeps your customers. BusinessWeek (March 2, 2009) reports cutting back just 4 Call Center Reps out of 3 dozen can send the number of customers put on hold for 4-minutes from zero customers to 80 customers. Do you really think 80 of your customers are willing to hold for 4-minutes every single day? And not only are long hold times a problem (and that is a BIG problem), but the fact is, 60% of consumers prefer speaking with a live agent. Consumer interest in speaking with live people is so strong that a few years ago a man named Paul English founded the “gethuman” movement with the sole objective of restoring personal contact in customer service. Gethuman.com is a pretty cool website. It is a database of secret phone numbers and shortcuts to reach a human at 500 major corporations. The first time I used it I’d just received an email alert on my BlackBerry from American Airlines that my flight from Columbus to Tulsa had been cancelled. I immediately called the toll-free number listed on the email message, but I could not get a live person to save my life. I remembered the gethuman movement and pulled up the website. There I learned that to get a live body at American, I just needed to hit “0” at every single prompt, ignoring all messages. If a website exists for the sole purpose of showing consumers how to get in touch with people, what does that say about customer service today? Bottom Line: Yes, times are tough for a lot of us, but the frontline is not where you want to make your cuts. You need to safeguard your service in this economy. Find other areas to make cuts and don’t cut from the frontline. You need the frontline to serve your customers and to keep customers from even thinking about defecting to the competition. Many of the major airlines are charging for checked luggage and Talbots has stiffened rules for returns. These are the kinds of cuts you need to creatively search for. The frontline is not where you need to make cuts. Need help brainstorming areas to make cuts that don’t include the frontline? Check out my friend John Storm of Brainstorm Network. He’s masterful at helping companies come up with ideas for profit generation, cost-reduction, and innovation. Have you ever shopped at the Container Store? If you’re working in customer service, and you want an enlightening (and thought-provoking) benchmark for your company, I urge you to get out and visit a Container Store this weekend. The Container Store is a leading retail chain specializing in home organization products, such as wire shelving, plastic shower totes, shoe bags, food packaging, knife and peg racks, and bins. Over the past four years the company has expanded throughout the United States , maintained infinitesimal turnover that is unheard of in the retail industry, and ranked 1st or 2nd on Fortune Magazine’s 100 Best Companies to Work For. Every Container Store employee is strategically trained to think flexibly to solve customers’ organization problems. And the company does this with an air of excitement by using the 1950’s Gumby clay-figure TV star. Get this…I read in Fortune Magazine that at a Container Store in Dallas, there’s an IT manager, who is also a part-time yoga instructor who teaches free weekly yoga classes to her staff. Her colleagues have responded enthusiastically since the classes began two years ago; 25% now join in the bending and stretching. “It’s a good mental practice that can be applied to physical purposes,” says Betty Murray, the IT Manager/Yoga Instructor. 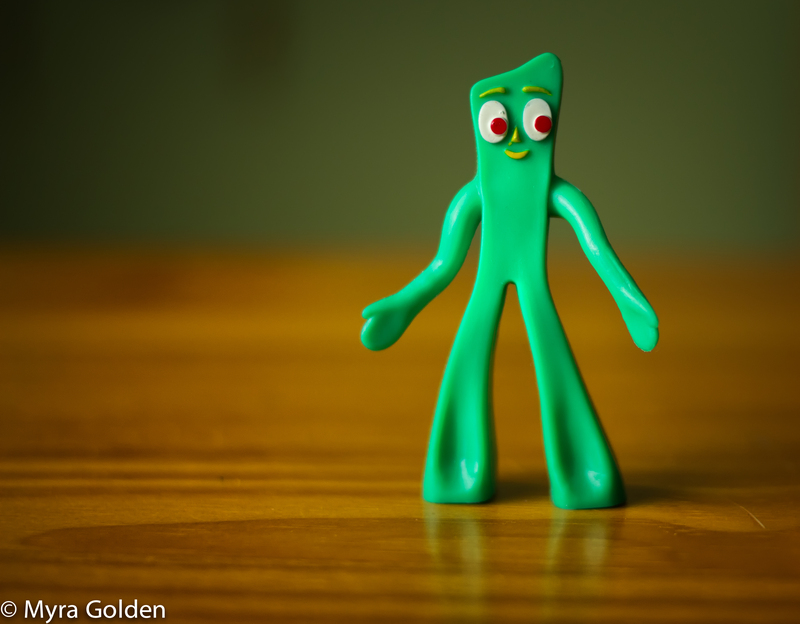 Being Gumby is about doing whatever needs to be done to serve a customer, help a co-worker, or complete a task. It’s about not getting “bent out of shape” when a customer makes a request of you that you’d rather not do. And it’s also about bouncing back quickly after having a tough encounter with a challenging customer. The Container Store constantly reinforces the Gumby culture by having a 6 foot tall wooden Gumby in the lobby at the company’s headquarters and giving away the annual Gumby award to the employee who exemplifies flexibility. Get your employees to adopt the flexibility of Gumby and your company will be well on the path to delivering Beyond WOW service! We are best known for our classroom training – and it is amazing! Our customer service training is led by the industry’s best trainers…experienced, engaging, and energetic. 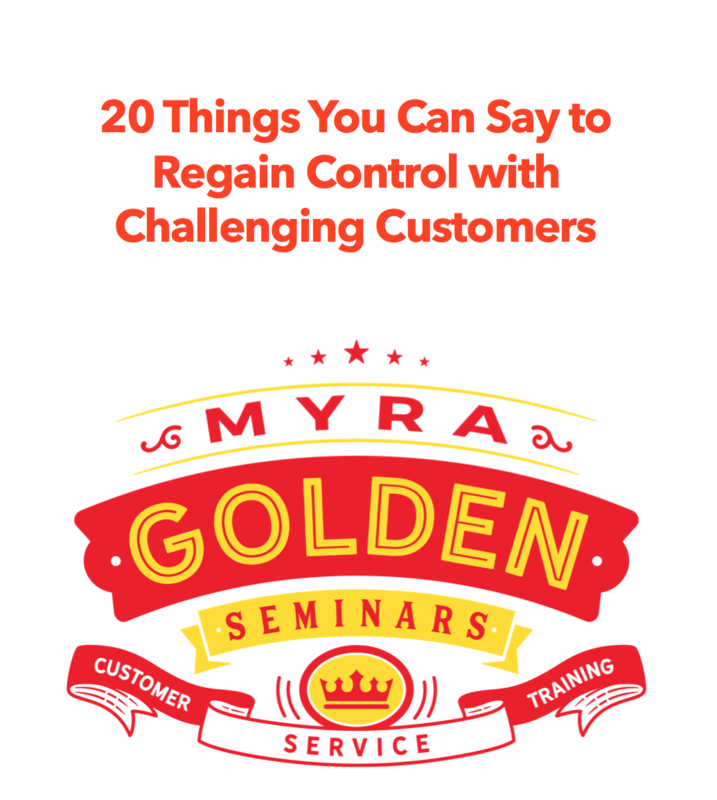 If you poke your head into a Myra Golden training session, you know this training is different. Participant involvement is astonishing. People are having fun and they are completely engaged. Most importantly, the participants are learning real-world strategies that will absolutely empower them to deliver exceptional customer service. Every one of our customer service training sessions is custom designed to meet our client’s objectives and every session delivers a measurable return on investment.